For me, Billie Holiday’s voice, her recordings, are going to be a zillion times more beautiful, moving and interesting than any perfume in a bottle. True, there are perfumes that surpass the human singing voice in beauty (when the voice in question is Jessica Simpson’s, Taylor Swift’s, or Justin What’s-His-Name’s), but a vocal genius like Holiday can achieve heights of passion no perfume can match. (Perfume has never made me cry.) I didn't expect the Holiday-inspired fragrance by Serge Lutens, Une Voix Noire (a black voice), to have the impact of the iconic singer. Who knows what Holiday smelled like? I can only imagine the scents of cigarette smoke, booze, sweat, make-up and perfume that surrounded her in the warm, crowded nightclubs where she often sang. Surely there were flowers in her dressing rooms as well as pinned to her hair. She owned a beloved dog, Mister, who would accompany her to gigs. Not many of these elements, as I imagine them, infuse Une Voix Noire. One can respect that Lutens and his perfumer Christopher Sheldrake avoided the obvious (well, the dog’s not “obvious”…why didn’t they put a little “Mister” in the bottle?) but what they’ve come up with could have been used to represent any number of women in modern times: singers, accountants, even teenage cheerleaders in Dubuque. Une Voix Noire goes on smelling like a strange fruity-floral. The opening presents an engineered “flower” (a neon bright, plastic-petalled creation) that smells like a mix of candy, aerosol (retro hairspray perhaps) and faux-smelling jasmine. (If you are expecting “gardenia” in Une Voix Noire, you’re out of luck; go to a florist.) As this high-pitched opening mercifully begins to fragment a little, I smell whiffs of cigarette smoke and strawberry musk (one friend said Une Voix Noire smells like the Strawberry Shortcake Shampoo she used as child). After the smoke (that momentarily masks the too-bright, too-sweet fruit and flowers), Une Voix Noire begins to smell like a beauty parlor, with its combined scents of chemicals, shampoo/soap, blow dryers and hot (almost scorched) hair. There is a roundness to Une Voix Noire’s overall scent; it has no sharp edges or jolting pulsations; it’s a weird ‘balloon’ of enduring aromas — the majority of which I can’t stand. When Une Voix Noir is smelled up close during the dry down, I detect notes that remind me of salty caramel/immortelle, benzoin and warm honey, but these play second fiddle to the opening fruity-floral accord that never fully disappears. Une Voix Noire is a subtly brash feminine perfume, more Gaga than Holiday. This perfume does not bring to mind ‘a black voice’ as much as it does a 1970’s nylon Afro wig — purple, ill-fitting and a little bit tacky. A 75 ml bell jar of Une Voix Noire is available for purchase in Europe (online and at the Lutens Palais Royale shop) for €130 ($168 US); you can also buy it in the U.S. (same juice, same size) at the Serge Lutens U.S. online boutique for $300. 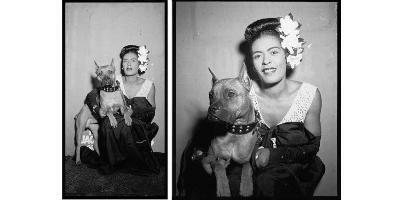 Note: top left image and top right image of Billie Holiday and her dog Mister were taken by William P. Gottlieb in 1947; these photos are used courtesy of the Library of Congress archives. Great descriptions, Kevin! Unfortunately, most of the Lutens are like that on my skin – either some weird smell (Jeux de Peau = Karmelkorn) or sadly just missing (Fille en Aiguille – I prefer Wazamba). Rappletea, I’m not having any luck with Lutens scents lately. Gee, I smelled this and really liked it. It did smell like a fading picked gardenia and a little “sad”. (Don’t ask me how, but like De Profundis, Lutens somehow manages to create melencholy smells). As an avid Holiday fan, she reports in her autobiography (which some historians doubt as even being an accurate ghost written account of her life) that when she toured for the USO, service members asked for her stockings sothey could carry the “smell of a woman” If this story is remotely true, she probably smelled pretty good. (Perhaps Channel, purchased at PX stores as part of the tour?). I am not certain what a “Black voice” would “smell” like. The main connection of Holiday to me is that gardenia. Yes, in her later years, Holiday’s voice cracked, and she sang in an increasingly melodramatic style. However, when I think of her singing, I think first of her early records, particularily her joyous version of Ellington’s Swing Brother Swing. That Holiday would be represented by a totally different perfumes. Dilana, I’ve gotten used to always being disappointed in ‘gardenia’ perfumes…they either smell phoney or are jasmine, and too SWEET. But that wasn’t my problem with Une Voix Noire…it just struck all the wrong notes with me. But…it has its fans! Hey Kevin, maybe (probably) I’m being dense, but what’s the cheerleader in Dubuque thing? And I saw a (again supposedly) biographical play on Holiday earlier this year. Made me want to actively avoid the music. I’m so tired of finding things that dissapoint/repel me about public figures, I just don’t know what to do. Kate, I guess you should avoid all biographical info and just enjoy the work? HA! The Dubuque cheerleader is simply another type that this perfume could represent; there is an aspect of this perfume that feels juvenile to me. I used to love going to Virginia, we had family reunions at Ferrum. Now that’s a place I’d like to find in a bottle! There’s no reason to avoid the music — it is an exquisite gift. It’s not like the money goes to Billie at this point. So many flawed or even downright horrible people have created great beauty. There’s something very “baby with the bathwater” about rejecting the creation because the creator is not someone you admire. I did not appreciate Billie Holiday until I saw some old footage of her performances in jazz clubs. It appeared to me that she really loved the genre of jazz and completely respected the musicianship of the other performers. Her voice was truly her instrument. That being said, I don’t usually enjoy hearing her sing. Based on the review, which was graphic, I probably won’t buy the fragrance, but I will at least give it a sniff. I know that there is a play about Holiday’s series of performances in Philadelphia, which deals with her arrests, but not much beyond that. Whatever you think of this perfume, don’t miss out on Holiday. Holiday was one of the musicians on whom the whole 20th century music rests. (along with Armstrong, Les Paul and a few others). She somehow both pioneered the notion of using a voice to capture the sound of jazz improvisation and the notion of the singer first expressing the meaning of the song, even when doing so altered the beat. Sinatra’s style is based upon hers. Amy Winehouse’s style is based on hers. Every whisky voiced chanteuse is based upon her. Heck Rhiana’s latest duet with Chris Brown,* is an update of a Billie Holiday classic. As for her personal life,yeah it was a mess. And yeah, it compromised her talent and ultimately killed her. On the other hand, do you refuse to listen to the Rolling Stones,to David Bowie, to Nivarna, Amy Winehouse, Guns and Roses the Beatles because they had addiction and relationship problems? Holiday, unlike Kirk Cobain, is not known to have a pointed a shut gun at a spouse. An of course, you can update that list of talented musicians with drug problems to any number of recent musicians who have gone through rehab. In Holiday’s case, she lived before there was any kind of even marginally effective drug rehabilitation therapies, and when the government went out of its way to jail and destroy the careers of “celebrity” users of any kind of narcotics, including marijuana. Holiday sang one of the few political protest songs of her era (Strange Fruit, which is about mob lynching) in a time when the government saw investigation and repression of “radicals” as part of its job. This and other disasters in Holiday’s life make her drug problems to be a bit more complex than simply a selfish artist wanting to have a good time after the show. Okay, so not everyone likes Jazz or Blues (and Holiday herself hated being sterotyped as a blues singer, which she regarded as somewhat dated). But chances are, who ever your favorite singer is, that singer has listened and learned a little from Holiday. So Swing Brothers and Sisters Swing. OOOPS, that was quite a rant. I told you that I was an avid HOliday fan. So this is the sort of passion Holiday can inspire. While I liked the perfume much more than Kevin. I agree, though, that the perfume does not capture this complexity. Yes Holiday wore gardenias in her hair (Originally to cover up hair burnt by a curling iron- hey, Kev, maybe there is something to your detection of hair parlor smells, after all). But if all she was a faded gardenia, no one would care. I, for one, appreciate your “rant,” and you may notice that Kevin, unconsciously or not, refers to strange fruit in his review. Thanks. Please don’t moralise at me about the habits of musicians. As I said, it is not a type of genre I am fond of in the first place, and not being fond of it in addition to learning more about the artist than I ever really wanted to know has made me more likely to avoid it rather than less. That’s all I really said. And it was not the addictions or portrayals of such that turned me the rest of the way off. For a lot of artists of all genres, addictions seem to be par for the course. My apologies if I offended you. I spent my high school years listening to HOliday, instead of the pop radio and so my passion got a little out of hand. There is so much more to her than the additiction which seems to be what she is famous for now. I did not mean to moralize, and if I did, I should not have. If my tone seemed critical towards you in anyway, (which on re-reading, I can see how it could be interpreted that way), I am sorry. It was a failure in my writing, because I do no want to ever make anyone participating in this website feel bad, or attacked or defensive. Many thanks, I enjoyed your comments. I don’t know much about Holiday so I am going to go back to her music again for another listen. This has been a great discussion. G ! The beauty parlor description sounds very hit and miss. Being a hairdresser I hate the smell of scorched tresses . But!! Strawberry shortcake smell is a child hood lust aroma, oh how I loved that dolls smell. SL is just so out there, do u think his stuff is just going over everyone’s head ? The story , the notes ? How far can one push an idea and creativity before it looses impact and no one understands the meaning ? Hmmm , food for thought. Thanks for the review, looking forward to sniffing it when it gets to OZ. Sinnerman, who knows what’s up with SL…there seems to be another perfume release every other month…usually that is not a good sign. At this point a new SL release generates zero excitement. Okay, now I’m not quite so peeved that my sample from TPC hasn’t arrived yet. Gardenia is a bit of a gamble for me anyway, but fruit? Beauty parlor? Strawberry Shortcake shampoo? Off to re-read some positive reviews to reassure myself that I maybe haven’t wasted $15 or whatever that thing cost. Emily. I pray you didn’t spend $15! My sample from SL never arrived (anyone got theirs?) but it looks like I don’t need to feel too peeved now. Ah, well, I don’t normally get on with gardenia perfumes, anyway. Abyss: hope it arrives, esp. if you paid for it! Kevin, thanks for a really well written piece. I still want to try this as I’m a SL fan, but loved how you discussed the connection (or lack of one) between this fragrance and Miss Holiday. I once had someone ask me why I loved her work so much as they felt her voice wasn’t “pretty’. I explained while there were more beautiful voices to be found, there was never a more truthful voice. I never tire of listening to her to this day. Arielle: yes, one hears that often about Holiday’s voice: “not pretty”…in the opera world the same was said/is said about Maria Callas, but both had ‘soul’…and expressed so much with unconventional vocal instruments. I’m a SL fan too…though it’s hard to tell lately! Oh no, I was so looking forward to a sample. But strawberry shortcake, surely this is bizarre for a perfume that is supposed to be all about smoke and gardenia? I am always looking for a perfect gardenia, to replace my much beloved Versace Blonde, really thought that this time it might be it! By the way, I do not know what this is about, but every time I smell Nahema, it makes me cry. I’m busy falling in love with Chergui: how is that for behind schedule! Merlin: ah, so you are still in the GOOD years of SL! Kevin, I’m so relieved that you also didn’t like this! I was starting to feel like a Philistine, but to me this just doesn’t work. For one thing, it has that dreaded buttered popcorn note from Jeux de Peau – shudder!!! And I also realized recently that all the SLs I really like – Bois de Violette, La Myrrhe and Daim Blond – are early ones. Just as well, I guess, given the US price of the bell jars. Noz…I haven’t found any scent worth $300…esp. When I know it is almost half that price in Europe. Bee, MKK, come to think of it, ‘reminds’ me more of Holiday! And now a dissenting Voix. Many recent Lutens have not worked on me (I’m look at you, les Eaux, Jeau, de Pro), but this one is lovely on me. I do get the “smoky Gardenia” with little fruit, and a pleasant hide-and-seek wearing with different notes popping up over a long wearing. No hairspray, no gummy bears, no sickly-sweet as some Lutens may go. I have a bell jar coming my way. This is why we are perfumistas-the description and debate are half the fun. Thanks, Kevin! Am I the only person who’s bothered by the name itself? AnnieA: the name is not great, but it does not bother me. I just watched a documentary on black opera singerscalled ‘aida’s brothers and sisters’ and the singers talked openly about the quality of ‘the black voice’…even giving Marilyn Horne honorary ‘black’ status due to her vocal type. I love her photo with the gorgeous doggie! My sample of this finally arrived this morning and I think it’s terrific. It’s highly distinctive. I certainly get the smoke and gardenia, and also a slug of tuberose. I’ve immediately ordered a bell jar. more Gaga than Holiday! hahaha Kevin, you’ve hit the nail on the head!